All India Law Entrance Test (AILET) is conducted for admission to the National Law University, Delhi exclusively. Students who crack AILET are eligible to pursue B.A. L.L.B (Hons), L.L.M and PhD Degree Programs on a merit base. There are 80 seats in B.A. L.L.B course. AILET Exam is the second most important law entrance exam in India after CLAT. AILET exam takes place every on the first Sunday of May. AILET exam is scheduled to be conducted on May 6, 2018 (3:00 PM - 4:30 PM). View AILET 2018 exam dates here. This article will come to your aid as it will help you stay abreast of all AILET important dates. The relevant dates of the AILET exam are all announced along with the official notification issued by the convening body which is NLU Delhi. Admit cards for the law entrance exam are made available to those who are eligible and those who successfully fill the form. This is a very important document and must be kept ready during the whole process till the admission process comes to an end. Students with admit cards must appear for the exam on the date and venue decided which are mentioned in the AILET Important Dates 2018. No electronics are allowed at the exam venue. Once the exam is over then soon after you can access the answer key. Here you will get a fair idea of what your scores will look like. If a student believes that there is an error in the answer key then students can raise their objections and make it known to the exam officials. A final answer key with no errors will be released thereafter. AILET Cut-off is decided after the answer key. The qualifying cut-offs and shortlisting cutoffs are different and the former does not guarantee that one will be called for counselling. 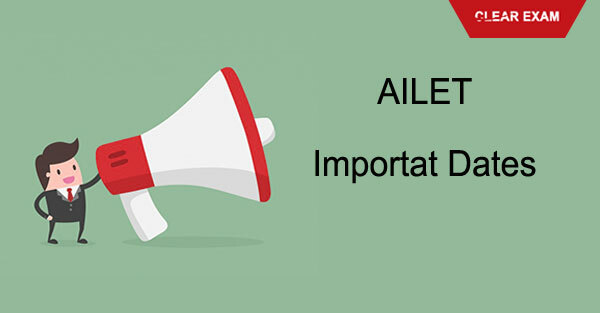 The date of announcement of exam cut-offs is mentioned above in the AILET important dates. AILET Results are the next step. On the basis of the result scores, the students will be shortlisted to come for counselling rounds. These students will obtain an admission letter. It is during the counselling process that documents will be verified. If a seat is still not filled after counselling then there will be spot counselling. That is how remaining vacant seats will be filled. Read AILET Entrance Exam details here. Go through the post to know the AILET Important Dates 2018.